Brilliant sunshine greeted me again on March 8, 2014 when I set off on another mission to explore more of San Miguel de Allende. I hopped on the local bus and asked the driver where to exit for the town’s biggest cemetery. Following his instructions it was very easy to get to the “Panteón de Nuestra Señora de Guadelupe”. After the older San Juan de Dios Cemetery had filled up, this cemetery was founded in 1948 and covers about 5 acres, all surrounded by a tall wall. 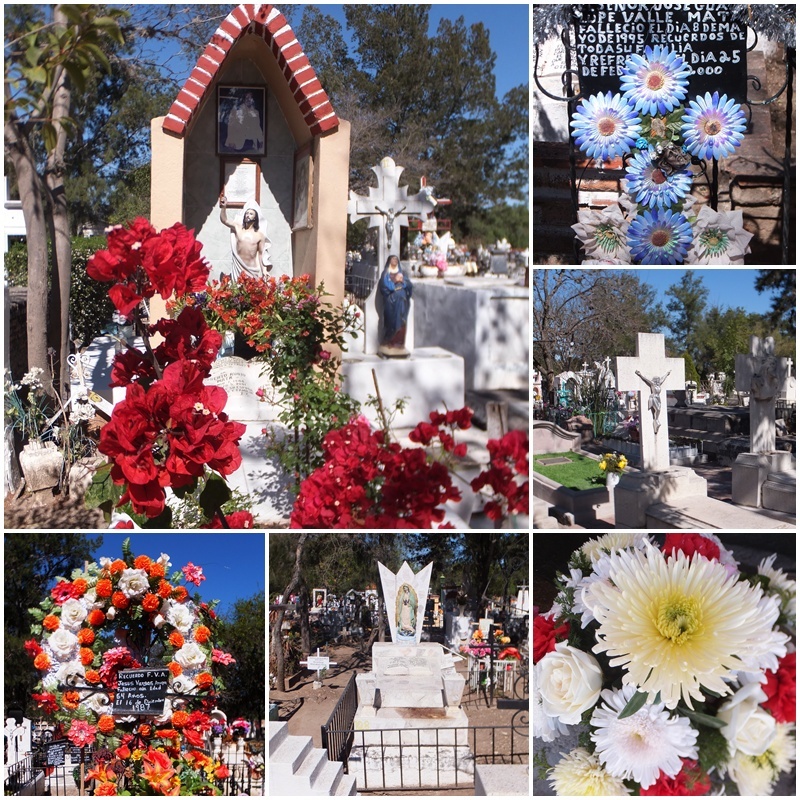 Every country has unique funerary traditions, and not surprisingly, cemeteries in Mexico are full of colour and flowers. A flower vendor sets up shop everyday right outside the gates of the cemetery, making sure that visitors will be equipped with the right floral greetings when they pay respect to their departed relatives. The funerary architecture at the “Panteón de Nuestra Señora de Guadalupe” cemetery in San Miguel de Allende is impressive. I admired entire reproductions of churches, miniature chapels, elaborate statues and graves of all shapes and sizes. 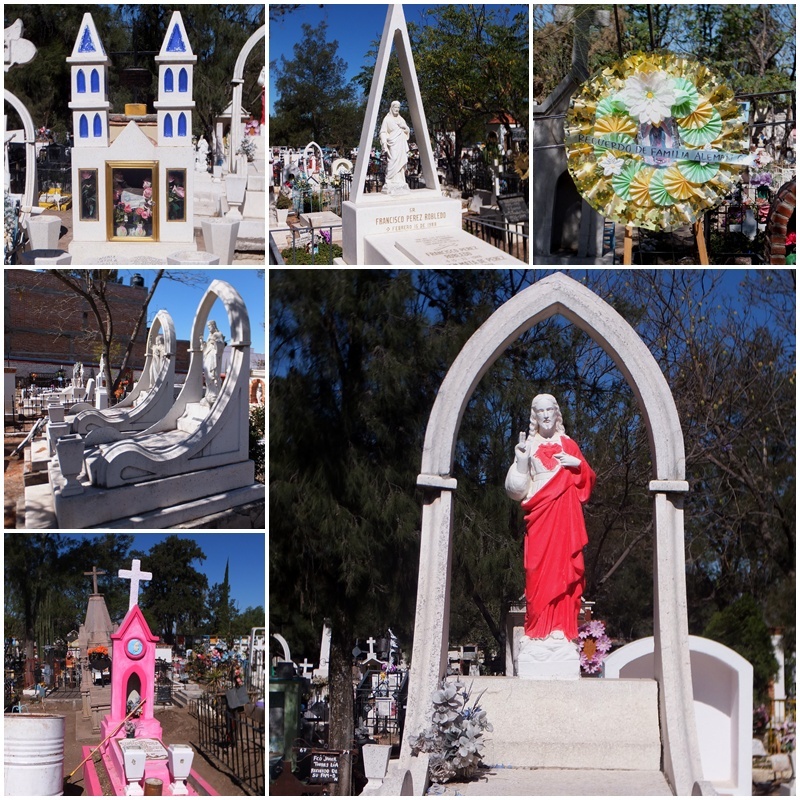 This cemetery becomes an important gathering place during the colourful festivities surrounding the Day of the Dead, one of Mexico’s most important traditions. After visiting the “Panteón de Nuestra Señora de Guadalupe” cemetery in San Miguel de Allende, I walked downtown to a little restaurant called “La Cocina”. On this sunny morning I was planning to meet my friend and local host Bertha who recommended this eatery. 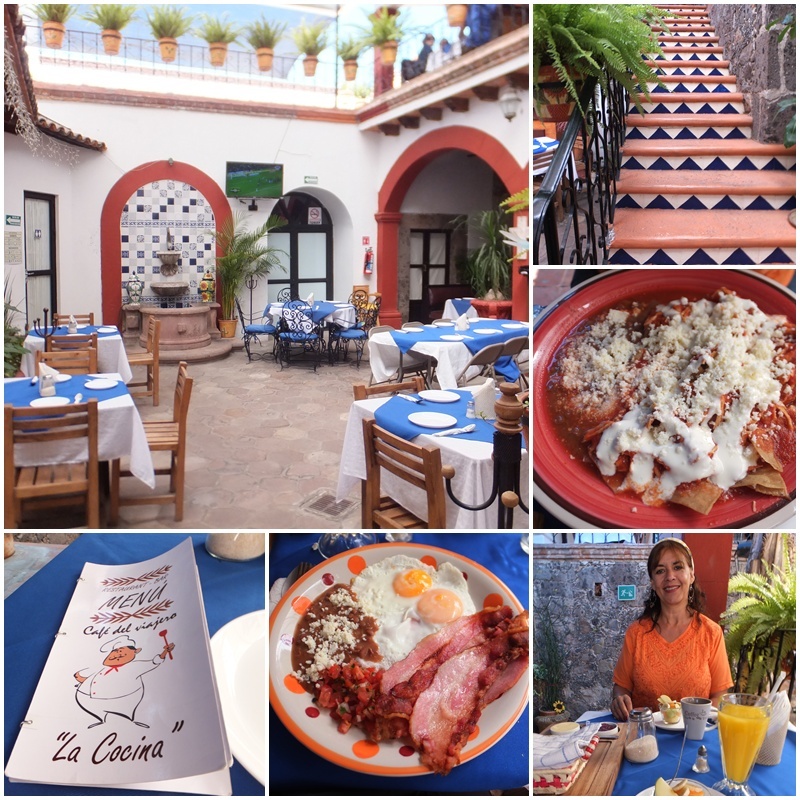 Serving typical Mexican cuisine, La Cocina is located in an old mansion that has a cozy interior courtyard. While I stuck to more traditional breakfast fare, my friend Bertha enjoyed “chilaquiles”, a Mexican breakfast dish with corn tortillas and green or red salsa. Chilaquiles are usually topped with cheese and/or Mexican cream, and often eggs or strips of chicken are added as well, making for a hearty start to the day. After a nice breakfast in the courtyard, my friend Bertha and I walked to the Jardín (the city’s main square) which was the location of Cubafest, the 11th edition of this Cuban festival. 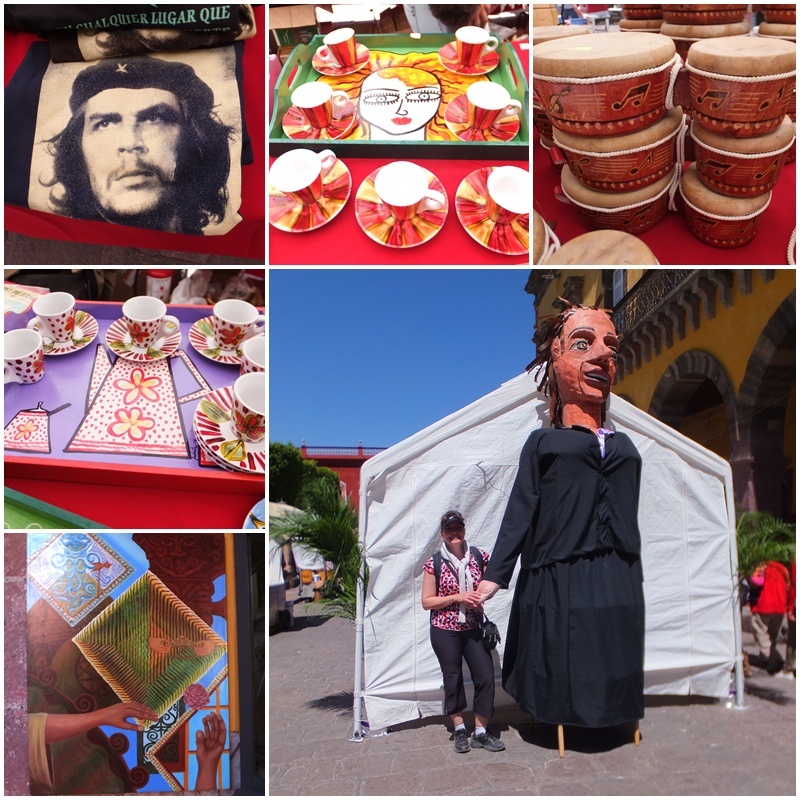 Cuban music was playing and a retail tent had been set up where Cuban merchants were selling traditional merchandise from Cuba: drums and other musical instruments, carved African statues, CDs, as well as the obligatory Che Guevara t-shirts. One of the giant “mojiganga” figures was keeping watch over the retail tent. The festival was scheduled from March 8 to 16, 2014 and featured many live concerts, lectures and film presentations. This festival was definitely going to go from the morning until late at night as Mexicans know how to throw a great street party.